With the end of summer looming near, Alpinestars just released the Alpinestars Copper Out Riding Jeans to keep you protected during all those fall-time riding activities. As the temperature finally tapers off, you can ditch the mesh pants and add some style to your local bike night. Starting with 13 oz. 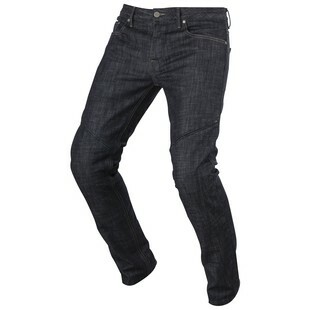 regular fit denim, Alpinestars then adds Aramid reinforcement panels to the seat and knee areas. On top of that, literally, they incorporate pockets for CE-rated knee armor. That's right, the knee armor height is still adjustable from the inside of the pants, but the actual armor is inserted from the outside of the pants, so you can quickly remove the armor when off the bike for a more low-profile fit! You can now have proper riding jeans, and with the armor removed, you can enjoy whatever you have planned at the end of the ride. This fall, you no longer have to stand out like a sore thumb to be protected.